Selma at the Abbey by E.J. Oxenham – cheesy-looking schoolgirl book that I picked up for 50 cents at a school book fair. Honestly, even if I can’t stomach the book, the 50 cents were well-spent just for blurbs at the back advertising Exciting Mystery Stories, Jennings (of the BBC) Stories, and Thrilling Western Stories. Rilla of Ingleside and Jane of Lantern Hill by L.M. Montgomery – a lovely gift from Virago. 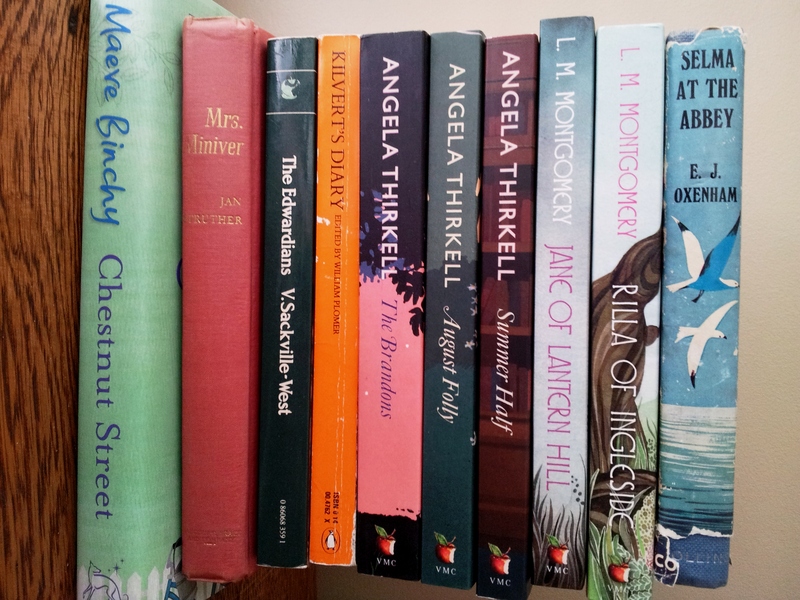 Summer Half, August Folly, and The Brandons by Angela Thirkell – an even lovelier gift from Virago. Kilvert’s Diary edited by William Plomer – the public library was having a sale this weekend and I was delighted to find this there. It has been on my TBR list for ages. I do have a weakness for books by or about the clergy. The Edwardians by Vita Sackville-West – another find at the library sale. Mrs Miniver by Jan Struther – Can you believe I’ve never read this? Chestnut Street by Maeve Binchy – I went shopping for Mother’s Day and instead came away with a book for myself. I read it immediately and loved every page, though it was bittersweet, knowing that Binchy is not around to write these wonderful stories any more. Also, Little G by E.M. Channon is slowly working its way around the globe to me. It left Scotland the first week of March and I have high hopes it will arrive here eventually. I am so jealous that you have managed to find ‘Selma at the Abbey’. Oxenham’s novels are really hard to find at a reasonable price these days and this is one I haven’t yet read. I’d never heard of Oxenham before (this sort of book was never the kind I gravitated towards during childhood) but I’m interested to try it. Definitely not the first time! I’ve read all of LMM books repeatedly, though, to be fair, most of that reading and rereading happened between the ages of 8 and 11. I’ve stumbled across so many quotes from Kilvert over the years that I am really excited to finally “meet” him for myself. That’s certainly a good excuse for treating yourself to these lovely editions. Yay! to Rilla of Ingleside (I still at 70 go back to Anne Shirley on misery days), but don’t know Jane of Lantern Hill, so thanks for that. Double yay for Angela Thirkells, could not be more different, apparently, but create a world where you can wander at your leisure and never be bored. Jane is definitely one of Montgomery’s also-ran heroines. Obsessed as I was by LMM, even I used to forget she existed. I’m interested to see how much I remember when I reread this. on May 25, 2014 at 15:40 | Reply Kathy D.
Now I read mysteries and am sticking to shorter ones as my eyes get tired quickly. I’ve never heard of Angela Thirkell. What does she write? Never read Mrs. Miniver, but have seen the movie several times, and just loved Greer Garson. Wanted to say that The Virago Book of Women Gardeners fascinates me. My library system has only one copy up at the main branch some 25 blocks away, and it’s noncirculating. So, I hustled over to Abe Books and bought a used copy for a few dollars, free shipping. Hi Kathy, Angela Thirkell wrote domestic middlebrow fiction, starting in the 1930s and continuing until her death in 1961. The majority of her books were set in Barsetshire, the fictional county created by Anthony Trollope. I adore her books and you can find many of them reviewed here (see the Reading Barsetshire button the sidebar). I hope you love The Virago Book of Women Gardeners as much as I did! I’d never heard of the Abbey books before I picked this up so it is fun to hear from people like yourself. As for Rilla, she was always my least favourite Blythe child and Rilla of Ingleside was probably my least favourite “Anne” book. I’m interested to see what I make of her now! Agree about Rilla being the least attractive of Anne’s children, though psychologically it’s quite likely that the youngest of six is spoilt and she isn’t proud of her lisp. Something could have been made of the unidentical twins, I think: but AMM was probably thoroughly sick of the whole family by then! A book similar in style to Mrs Miniver is Try Anything Twice, again recommended. Current reading is Catherine Gaskin’s The Summer of the Spanish Woman. I’ve got The Real Mrs Miniver (the Slight Foxed edition) sitting on my shelf, waiting to be read once I’m done with the fictional Mrs Miniver! Awwwww, Jane of Lantern Hill is INDEED a lovely gift to receive. You’ve read it before? It’s my second-favorite of all LM Montgomery’s books, narrowly edged out by The Blue Castle. Really? Very interested to hear your rankings. I loathe The Blue Castle and always have but my memories of Jane of Lantern Hill are shockingly vague. it will be interesting to see how much of it is familiar once I start reading. I am pretty certain you’ll love Mrs Miniver, Claire. I’d stake a lot on it. And I need to read The Edwardians soon. Love me some VSW. I’m pretty sure I will too! on May 27, 2014 at 07:38 | Reply A.M.B. That’s a beautiful pile of books! I re-read Anne of Green Gables recently (with my six-year-old twins), but I haven’t re-read Rilla of Ingleside in a decade or more. And I’ve never read Jane of Lantern Hill! How lovely that you’ve introduced your daughters to Anne of Green Gables already! on May 31, 2014 at 06:58 A.M.B. My daughters just love Anne of Green Gables! I wrote about it on Feb. 27th in a post called “Dear Anne Shirley: Redheads CAN Wear Pink!” My twins have red hair and they just couldn’t understand why Anne didn’t appreciate the color! When were the Abbey books published? I guess they slightly antedate the Chalet School ones (which I loved because I found the foreign languages very exotic – and here I am living in France!) I borrowed a couple of Abbey books from a friend when I was about 7 and remember their being obsessed with electing Flower Queens and their maidens. Is my memory a bit off here? This one was published in the 1950s but a quick Google search tells me that the series started in 1914, with the bulk of the books published in the 1920s and 1930s. Suspected as much, Claire, thank you. I think my friend’s mother probably read them before her, just as mine introduced me to Angela Brazil.